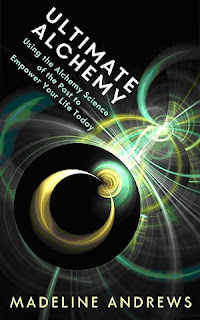 Today we are interviewing Madeline Andrews about her book "Ultimate Alchemy: Using the Alchemy Science of the Past to Empower Your Life Today." Madeline Andrews, the "inner g diva" holds a Doctorate in Metaphysical Sciences from the University of Metaphysical Sciences and has been studying topics in metaphysics, spirituality, sacred geometry, and energetics for over twenty years. As a Reiki Master and Kaballist, her promary vision is to empower people with energetic products and services of consciousness through awareness. The purpose of this book is to provide options beyond a linear perspective. As humans, we sometimes feel stuck and limited in our choices. Alchemy is about transmuting or shifting states within oneself and Ultimate Alchemy is about using energetic concepts to shift states within oneself. This is done through the energy body and the mind, which the book explains. I think people who want to take personal accountability and responsibility for their inner states and perceptions would empower themselves and greatly benefit from this book. This book looks into concepts and systems and explains just what they are. What inspired you to write a book about using alchemy science to empower yourself? I wrote the book because I have talked with several people from various walks of life and the common denominator was that they were hurting from so many aspects of life - health, monetary, family, relationships and other issues. And the concept of alchemy - transmuting something that is "base within someone" into something that is "gold within" was a powerful way to empower them past their pain. For people not familiar with alchemy, could you give a basic definition? The word "alchemy" actually derived from the vibration of a tone. Alchemy entails transmutation or raising one's energetic vibration through awareness. When did you first get interested in studying alchemy? I became interested in alchemy and other conceptual presences classified as "metaphysical" over twenty years ago, after undergraduate school, when I had a thirst for this concept called "truth." The path caused me to study synergetics, quantum science, and other subjects that were vastly different from my degree in English. In the book, you write about using conceptual modality behind the science of alchemy to shift conceptual perspectives in modern day life. Can you elaborate on this process? In the book, I correlate the fourteen traditional keys of alchemy with fourteen modern day energetic concepts, and place them around a shape called a tetrahedron, while using certain energetic concepts in a way that all four worlds on the Tree of Life would be working simultaneously. What do you think are some of the biggest misconceptions people have about alchemy? Probably the biggest misconceptions are that alchemy is something evil or forbidden and that it is far out/ "woo woo." But the science of alchemy is a spiritual one that actually understands and teaches that nature of the Universe - that a spiritual seed can be planted into a dark earth (unawareness) and it produces something in the physical material world. It understands the aspects of energy upon the Tree of Life. The most interesting and empowering thing would be that everything a person experiences is a system and the powerful natural thing about systems is that there are twelve degrees of freedom built in every system. I think my book will impact its readers because he or she will realize that quite a few solutions to their issues aren't our there, but are within, lying dormant, waiting to be activated through awareness. The way a person perceives things affects the way he or she sees "reality." If the reader plays with the energetic concepts presented in the book, that which is dormant has the strong possibility of awakening through awareness.